Nowadays the ability to transfer the clarity and precision of emotions is a rare quality to possess for any mature artist. So it’s simply amazing to discover it in a young painter. After having found his style Alexei Ivanov distinguished himself from his creatively infantile generation. Nonoccurrence between time and emptiness, the lack of professional conformism all the kind of qualities are hard to find. But only they give opportunities for further development. …Streets with no residential buildings, advertisements signaling into emptiness, rotten sheds, theatrics of administrative buildings, lost and collapsing fragments, replica of an old town, newly-built quarters of residential district, architecture behind the barbed wire, facades of Stalin’s era that have become today’s monsters… The artist chooses places that are either meaningful and symbolic or on the contrary unnoticeable, hidden and forgotten. 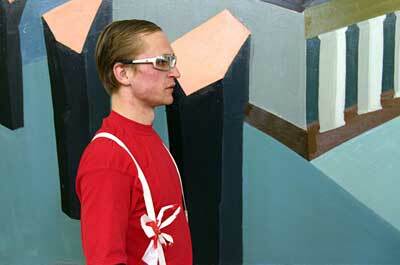 But all together they are a part of the metaphysical topography of Minsk – the eclectic object of post-soviet territory. The artist easily transforms the real urban motives and creates a certain new space on his canvases. It allows our consciousness to shift into other realms, to sense different rhythms and therefore to better grasp the concept of Time. The urban objects depicted by the artist are simply the reason for expression of the metaphor of extremely complex and ramified spaces. The brutality and detachment of architectural objects in combination with deliberately banal names of his works are alerting for the audience. It’s provoking the latter to search for something fundamental and invisible inside the void of a painting where tense absence of the sounding is important and not the source of the sound. Alexei Ivanov was born in Minsk, Belarus in 1978. 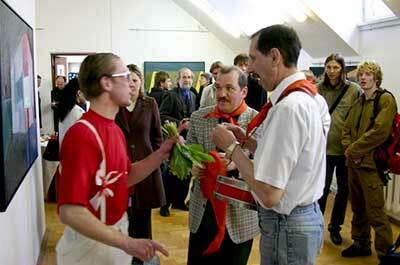 Member of Belarusian Artists Union.